Clearbra Paint Protection Film Done Right! 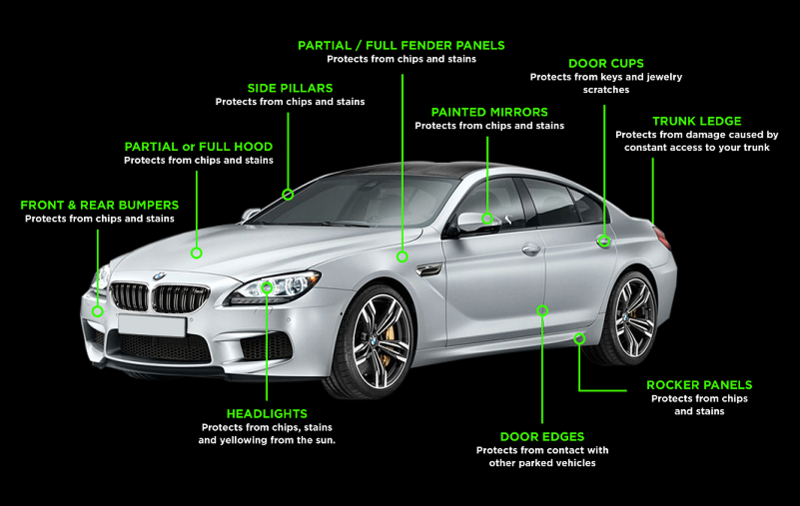 "Clearbra", "Clear Shield", "Clear Mask", "Invisa Shield", PPF, all popular names for what is essentially a Paint Protection Film. This is an amazing film that is made from urethane and is strong enough to keep the finish of your car, truck, van, or RV looking like new and safe from the acidic damage that bugs can cause. It also undoes what the birds "do" to unprotected painted surfaces. It is widely believed that this film was born out of the first Gulf war with Iraq. Once called "Helicopter Tape" because the military would apply it to the Chopper blades to keep the sand from blasting the paint off. At 8 to 14 mils this material did exactly what the military was hoping it would do... protect the paint. Then, someone got the great idea that what would protect a Chopper would protect a car. The idea took off. Introduced to the east and west coasts first, this urethane material quickly caught on and replaced the ugly black "leatherette" bras that were a pain to put on and then take off every time it rained. Urethane film is unlike the old leather bras of the 70's and 80's, this film does not need to be constantly removed before it rains in order to save the painted surface. Urethane clearbra material is as permanent as you want it to be, only being removed when damaged. HEXIS, has been a self-adhesive film manufacturer for over 25 years. Hexis Bodyfence was developed by HEXIS R&D based on cutting-edge technology and will protect your vehicle against external aggressions. HEXIS is a leading European manufacturer of self-adhesive vinyl (PVC) films and digital printing media for large format inkjet printing used for sign making, vehicle marking, decoration and protection! Also an Industry Leading Paint Protection Film. Flexishield is manufactured by parent company Reflek Technologies. "All products are made in the U.S.A. in our state-of-the-art facility located in Chandler Arizona. Our origins as a high-tech laboratory and a long history of specialty production has elevated ReflekTech to that of a world-class manufacturer. We carefully tailor and monitor every step of our production process to ensure the quality and consistency that our customers have come to trust." We have tried this amazing product and feel it rivals all other PPF (Paint Protection Films) currently on the market. Reflek Technologies’ extensive warranty certifies all FlexiShield product lines to be free of any manufacturing and workmanship defects for a period of TEN YEARS from the date of installation on painted automotive surfaces. We trust both of these high quality companies and you should too. What does it cost? How much can I expect to spend? Actually, the cost varies depending on coverage. "My car NEVER used to get rock chips. Why does it seem to get them now?" If you've ever said that, you were right. 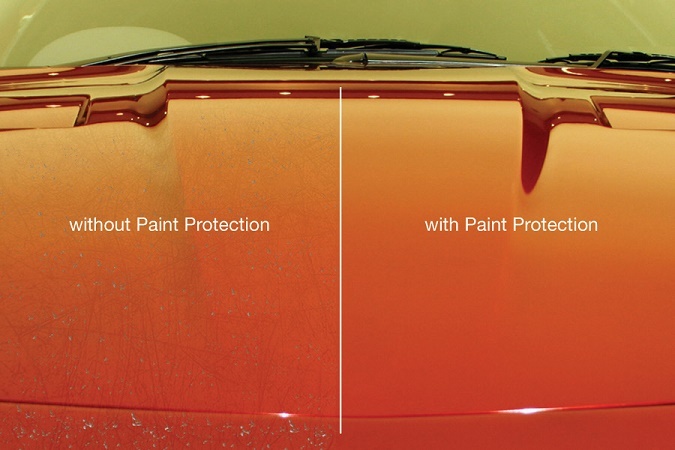 Years ago the paint finish on vehicles was more durable and longer lasting than it is today. Why is that?? During the last part of the 20th century, there was a movement to make everything more "Eco-friendly" and automotive paint fell under the scrutiny of the federal government in the U.S. other countries of the world, and especially Europe. Before long legislation was past to mandate (force) manufactures to transition from oil-based paints and finishes to a more "Eco-friendly" water-based paint and finish. What "saved the planet" didn't do much for the finish of the car. Water based paints are not as durable as oil-based paints as they are typically softer and do not bond as well to the vehicle surface. The result? After a few thousand miles, the front of your new car looks 10 years old, with rock chips and acidic stains from rain, birds, and bugs. If I have paint protection film applied to my car, will my paint fade where it is not covering the paint, causing a noticeable difference? Our material has no UV stabilizers added to the film. There is no need for this because there are no dyes contained in it, unlike window tinting films where UV stability is a definite plus. 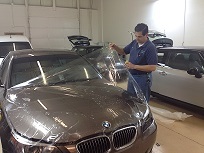 Therefore, the unprotected surface where no film is installed and the protected surfaces will fade at the same rate - as if there was no clearbra added to the vehicle.